If I was going to be stranded on a desert island, and could take only one candy, Rocky Road would be my choice. I know that Rocky Road can mean different things to different people, depending on where you live, but for me it's white chunks of soft and spongy marshmallows together with crunchy nuts, all covered in a rich dark chocolate. When I make Rocky Road I like to temper the chocolate and use homemade marshmallows. I know these two steps mean a little more work, but if you want an amazingly good Rocky Road, it's definitely worth it. So what is tempered chocolate and why do we need it for our Rocky Road? I will try to explain, not so much the science of it, but the process of making it. First, when you buy good dark chocolate have you noticed that it is nice and shiny, dry to the touch, with a hard and brittle surface which "snaps" when you break it? This is what is called "tempered" chocolate and, unfortunately, once chocolate is melted it loses these characteristics. While it is still great tasting, and you can use this melted chocolate for making Rocky Road, it won't have that lovely shine and brittle dry texture. Instead, if stored at room temperature, it will look dull and, with time, gray streaks will appear (called bloom), and its' texture will be a slightly soft with an almost greasy feeling. So that is why once the chocolate has melted it needs to brought back to its tempered state, before adding the marshmallows and peanuts. To make this Rocky Road we are going to do what is called a quick two step "seed" temper. It's really not hard to do but you'll need a chocolate thermometer as a regular candy thermometer does not have a low enough temperature reading. Step One is to melt 3/4 pound (340 grams) of a good quality, semi sweet or bittersweet chocolate, and once the chocolate has melted and has reached a temperature of between 115 - 119 degrees F (46 - 48 degrees C) it's ready for the next step. Step Two is to cool the chocolate down to a temperature of between 89 - 91 degrees F (31 - 33 degrees C). This is done by gradually stirring into the melted chocolate the remaining 1/4 pound (115 grams) of finely chopped chocolate (this is called "seeding" because you are adding "seeds", or chopped chocolate, to the melted chocolate), using a rubber spatula or wooden spoon. Check the temperature often as you don't want the temperature to fall below the target temperature (and you may find you won't use all the finely chopped chocolate, or conversely, you may find you need to add extra chocolate). Finally, all that is left is to quickly fold in (because the tempered chocolate will not stay this temperature for long) the marshmallows and peanuts and spread onto a baking sheet. Rocky Road: Have ready a lightly buttered or a parchment paper-lined baking sheet. In a heatproof bowl, placed over a saucepan of simmering water, melt 3/4 pound (340 grams) of the chocolate that has been coarsely chopped. Once melted, remove from the heat and check to see that the temperature of the chocolate is between 115-119 degrees F (46-48 degrees C). Once at that temperature, gradually add the remaining 1/4 pound (115 grams) of finely chopped chocolate, stirring with a rubber spatula or wooden spoon, until a chocolate thermometer inserted about a 1/2 inch (1 cm) into the chocolate registers 90 degrees F (32 degrees C). (You may not use all the chocolate.) Then quickly (as the chocolate sets very fast) stir the marshmallows and peanuts into the tempered chocolate and stir just until they are completely coated with chocolate. Immediately spread the rocky road onto the baking sheet. Let the Rocky Road sit at room temperature (or place in the refrigerator) until firm and then cut into pieces. Rocky Road can be stored, in an airtight container, at room temperature for about a week or it can be stored in the refrigerator for about two weeks. Makes about 1 1/2 pounds (675 grams) Rocky Road. Preparation time 1 hour. 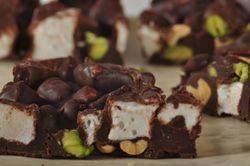 Note: You can make this recipe for Rocky Road without tempering the chocolate. Simply melt the full 1 pound (450 grams) of semi sweet chocolate in a heatproof bowl placed over a saucepan of simmering water. Once melted, remove from heat and fold in the marshmallows and peanuts. Spread on a parchment lined baking sheet and place in the refrigerator until set. Cut into pieces and store the Rocky Road in the refrigerator for up to a week.